When James Horne and his family returned to Normandy in about 1822, they lived in the Flexford area, later moving to Normandy Hill Farm leased from the Reverend William Parsons. Their home was always available for Sunday school and prayer meetings. Although he had to work long and hard both as a farmer and schoolteacher to support a growing family, he travelled many miles often walking, seeking ways and places to establish his faith and preaching Methodism whenever possible, usually in private dwellings. In 1850 he built a chapel and a pair of small houses in Glaziers Lane, one of which is now called The Croft and it was in that chapel that he conducted services, preaching with the vigour and zeal that was his hallmark. Since he was a schoolteacher it would be reasonable to presume that he established also a schoolroom in the chapel. The 1851 census shows the chapel as having had "60 free sittings and 30 other sittings". Richard Chapman a Wesleyan Minister from Guildford signed the afternoon service on the day of the census. Although he held the office of Circuit Steward, James preferred to preach rather than administer. In 1853 "land together with chapel therein lately erected" was conveyed by James to the Methodists, and used by them until 1886. When John Parrott brought his family to Normandy from Buckinghamshire in 1862 he purchased the Normandy Manor Estate, including Normandy Hill Farm, and his family became close friends of the Hornes. In 1871 his two sons William and John witnessed the Last Will and Testament of James Horne, who by then was living, with his wife and daughter Elizabeth at Mariners, Guildford Road. James' two sons, James and Joseph and their respective families were living nearby, presumably in the two cottages adjoining the chapel in Glaziers Lane. The two brothers, William and John Parrott, played an important part in the Methodist movement in Normandy. 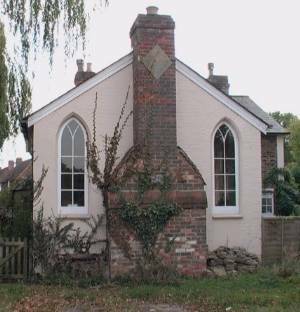 Minute books of the Quarterly Surrey and North Hants Mission Circuit show that they both preached in the area and opened their home at what is now the Manor House for Circuit Meetings. The minutes also show that in April 1861 James Horne's son Jabez, born 1837, preached his Trial Sermon and was recommended to be a local preacher. About this time the Methodists purchased from the Parrotts two pieces of land near the crossroads. The larger for £45 and the adjoining strip to the west for £6.10s.0d and on the site, in 1886, built the large chapel in Gothic style consisting of two halls, one for services and the other for social functions. The old and small chapel of 1850 became defunct, but in the early 1900s was used as an evening institute for teaching shoe repairs and cookery. By 1898, when the Parrotts left the area, the new chapel had a flourishing congregation. Some referred to the building as a church others as a chapel. Even in communal conversation, a group would quite happily mix the two names. John Wesley never wished the Methodists to leave the Church of England. The definite break, however, came in 1795, four years after his death. The followers were known as the Wesleyan Methodist Church, later breaking into various smaller schisms only to rejoin again starting in the early 1900s. 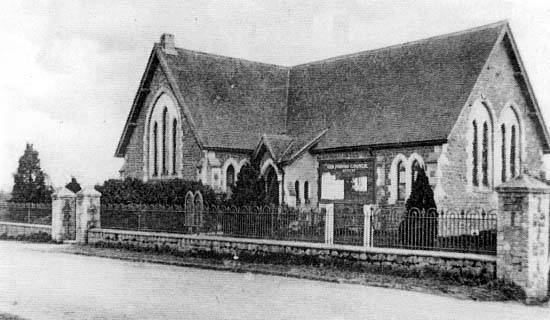 The chapel at Willey Green was not registered for marriages until 1964 and the building was too small in any case to hold anything but a very modest wedding function. Chapel worshippers were invited, therefore, to have their wedding and reception in the larger Methodist Wesleyan Chapel at the crossroads. Rosie Coleman, the daughter of Ernie Coleman, the Superintendent of the Congregational Chapel married Eric Privitt in this chapel in October 1935 as did their very good friends William and Catherine Fooks in July 1938 but on that occasion their own Congregational Minister, the Reverend Davis, performed the service. Cyril and Doris Prangnell, although married in 1940 at St. Mark's Church, also held their wedding reception in this chapel. The 1950s witnessed the start of a dwindling congregation. A visiting preacher, John Newland, recalls taking the regular service, of four hymns and a full sermon, to a congregation of just four children. It is believed that Gladys Marshall and Alfred Williams last used the chapel for worship. In 1953 the Chapel was de-consecrated and the building was sold to C J Williams when it was converted and used as a drawing office by architects until 1965. The building proved too difficult to maintain, it became derelict, infested with vermin and was eventually demolished in 1970. 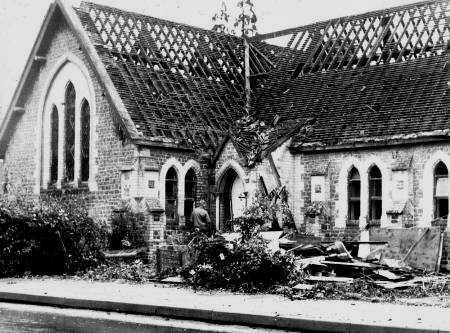 There was no great uproar when the building was demolished and the wooden pews burnt, and only after the disappearance of the chapel as a landmark, was its passing regretted. From 1953, until demolition in 1970 by Messrs. Channings of Guildford, the Chapel had a trail of planning applications for re-use as industrial premises, re-development into shops with flats over and simple residential housing. Today the site (less that conveyed to the Surrey County Council for a bus lay-by), is occupied by a pair of semi-detached houses; Chelsford and Moelfre built by Thomas McAllister (a local property developer), then trading as Thomas Alfred Ltd.